The Visallo team is excited to announce the release of our first ever special edition of Visallo, the GOT Kill Chart. 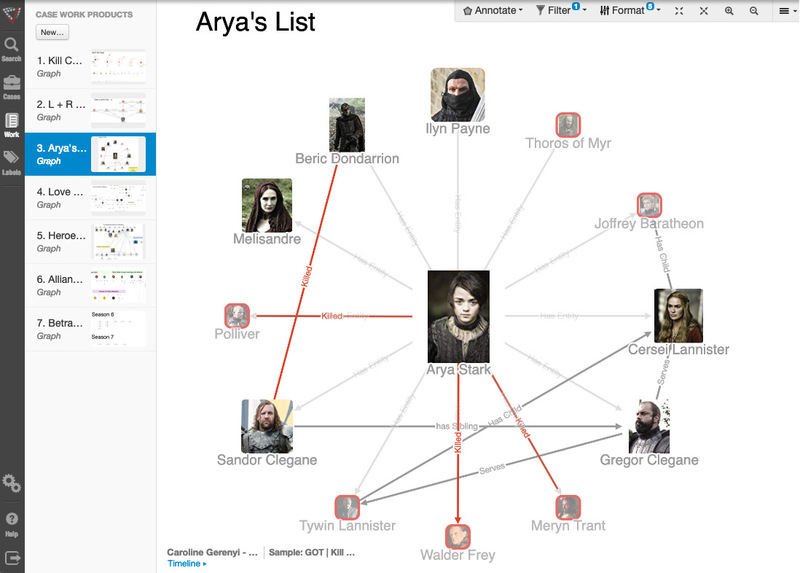 We’ve added data from all seven seasons of Game of Thrones into our investigative link analysis tool to allow fans a unique way to visualize the complex relationships between characters, explore plot lines and theorize about the upcoming season, and map out the betrayals, murders, affairs and revenge plans of their favorite residents of Westeros. We’ve provided seven interactive link charts to make it easy to start exploring Visallo’s platform. 1. Kill Chart: Our most popular visualization shows not only the direct kills by character, but related kill chains and kill networks, as well. Zoom in to any particular character to see their part of the kill tree. 2. L + R = J: The last scene of Season 7 had plenty of viewers saying “wait, what! ?” (and others saying, “yes, i knew it!”). Use this graph to uncover the relationship between Daenerys and Jon. 3. Arya’s List: Arya’s out for revenge and has proven she can skillfully execute on her plans. How successful has she been and who’s left on her list of enemies to kill? Visallo is used by investigators, researchers and analysts around the world for fraud investigations, law enforcement, intelligence, internal threat detection and more. 4. 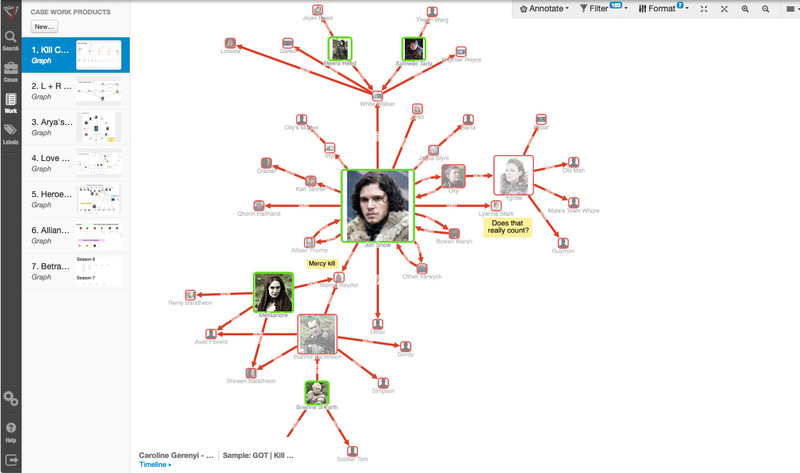 Love and Death in Westeros: Untangle the web of lovers, marriages, broken engagements, intro-family kills, secret affairs, love children and more in this classic GOT link chart. 5. Heroes (Remaining): Check out the heroes - and villains - still standing going into the final season, and which of their loyal friends are still alive. 6. Alliances Among Houses: The alliances between houses have become impossibly complicated. Use this link chart to see where loyalties fall, who’s switched sides, which houses are undecided, and which houses played the Game of Thrones… and lost. 7. Betrayal Timeline: Relive every betrayal from the past seven seasons, from the early betrayals, such as young Sansa selling out Arya to win favor with her future husband, all the way to Olenna’s dying admission to Jamie. Dashboard: Which house has the most members still alive? Which episode was the bloodiest? Who is the top backstabber? And who’s atop the leaderboard for highest kill count? Graphs on the dashboard answer these questions and more. In addition to viewing and editing the link charts we’ve already created, you can also create your own graphs and export to an image for easy sharing (right click on your graph to see export options). Feel free to share online and spread the word about the Visallo Kill Chart. We’d love to see what you come up with and what new theories you uncover! Share your insights with us on Twitter at @V5Visallo, Facebook at V5Visallo or via email at info@visallo.com. Interested in Visallo? Contact Us to chat with the Visallo team or schedule a demo.